Claire was the first one off of the bus when they arrived at the Randolph Animal Rescue Shelter and Reserve. She took a deep, excited breath as she looked around. As far as she could see were magnificent trees and lush fields. She’d done her research. She also knew there were African-like savannahs, rain forests and what she really came to see – a bamboo forest scattered with giant pandas. It was a warm spring day and the land before her looked wild and free. Julia was last off the bus. “Even I know that and all I came to do is get out of math,” Julia said laughing. “Very good,” Mr. Potts said. “You have a smart class Mr. Potts,” a voice we’d never heard before called as she almost skipped towards them. Claire looked over at her teacher and the woman was now shaking his hand. The lady caught Claire’s eye and smiled. Claire smiled back – thinking that the woman was probably about her cousin’s age – 25 tops. “Yes!” the entire class shouted at once. “Does everyone have their notebooks and animal pages with them?” Mr. Pott’s asked. Several kids ran back on the bus – including Julia. Claire laughed. Julia and the others caught up with the group as they were entering a large green and tan building that sort of disappeared into the landscape. “I wonder if they did that on purpose,” Claire whispered to Julia. “What?” asked Julia – still breathing a little heavily from the run from the bus. “The building. The colors. They sort of blend into the background. The place is huge and I didn’t see it until now.” Claire said. “Excellent,” Emma smiled at Claire again. “I’m glad someone noticed and it was on purpose. Did everyone hear what…” Emma looked at Claire. Claire looked down shyly and then looked up and said her name. “Claire.” It was only her class after all. “Does it work?” Caleb Greene asked. Caleb was a smart student in Claire’s class, but he was also a know-it-all and his tone was sarcastic. 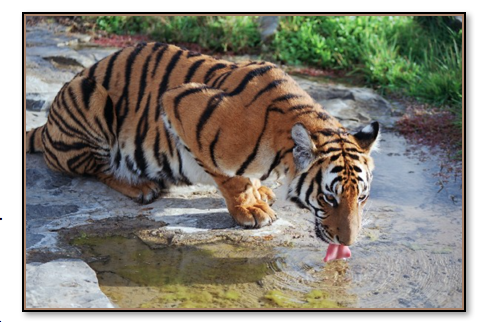 “We think so,” Emma said, ignoring the sarcasm, “they stay away – each species in the habitat that was created for them. We are home to endangered animals such as the grizzly bear, the mountain gorilla and the black rhinoceros, which is critically endangered. We are also home to animals on the vulnerable list. Anybody know what that means?” Emma’s eyes twinkled as she looked around the room at the raised hands. She called on Claire. “It’s as huge as Georgia in here,” Julia observed. “That’s bad,” Veronica Coolidge said. Claire liked Veronica. She was one of Julia’s best friends and played at their house a lot. She had long, long, long light brown hair and amber-red eyes. “Can we see them?” Julia asked. “Write Movie as the topic and I want two facts about each animal written directly from the movie,” Mr. Potts said. The class was led ito a theater and Julia, Claire and Veronica hurried to sit in the front row – so did Caleb Greene. He leaned over to Claire. “Nice giant panda facts,” he said – almost nicely. real or playing her. He teased her a lot and that bothered her as much as she liked the attention – only she didn’t tell anyone the last part. 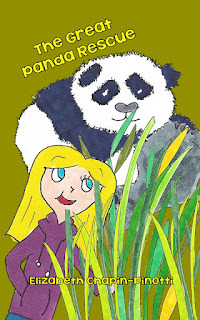 The Great Panda Rescue Chapter Two Interactive Reader with lessons activities and printables. The Great Panda Rescue Chapter One Interactive Reader with lessons, activities and printables. The Great Panda Rescue Chapter Three Interactive Reader with lessons, activities and printables.